Chasing waves is a lifelong passion for Jarrah Orphin and he’s harnessed this love of the ocean to dive into research in the marine renewable energy field. Mr Orphin has been awarded the Laurie Prandolini Research Fellowship through the Institute of Marine Engineering, Science and Technology (IMarEST), and will use the $14,000 grant to replicate the same scale model tests he is conducting at the Australian Maritime College at another international university. The fellowship was established to honour Laurie Prandolini, who made an outstanding contribution to the maritime community in the Australia, New Zealand, and South Pacific region. It provides an annual grant to a doctoral candidate or postdoctoral researcher in the marine engineering, marine science or marine technology domains. Mr Orphin, 26, grew up on the beach in Milton on NSW’s South Coast and wanted to pursue tertiary studies that combined his love of the ocean with his interest in building things. He relocated to Tasmania in 2012 to undertake a Bachelor of Engineering (Ocean Engineering) at AMC. “I grew up on the beach and I surf a lot as well, so I think that ultimately led me to researching wave energy,” he said. “It started off as an experiential practice, and now it’s a pretty good feeling to learn the theory behind the waves and some of the mathematics and physical systems that are used to describe the ocean environment. 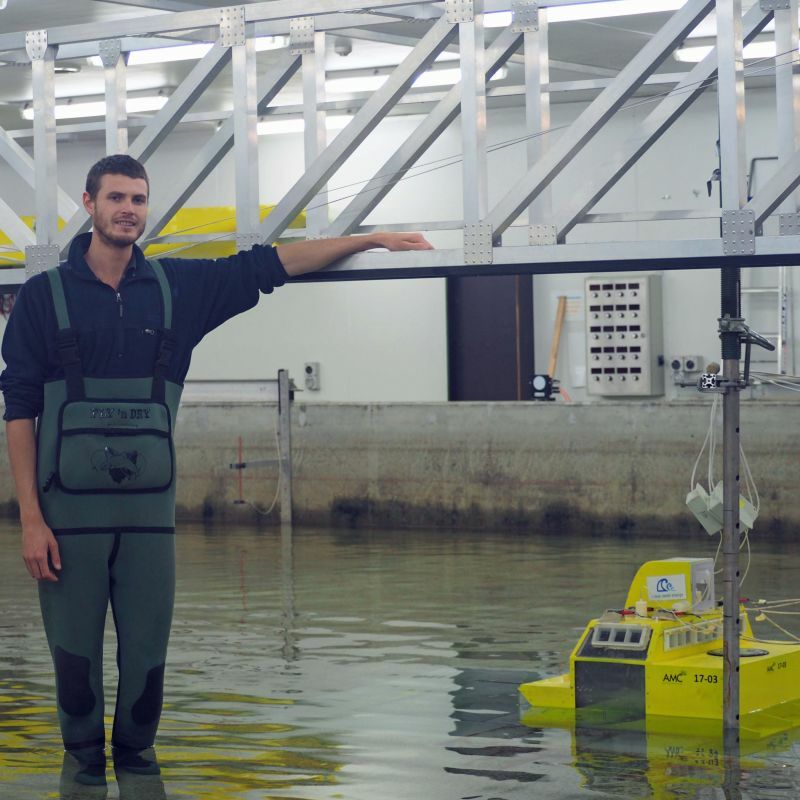 After graduating in 2015, Mr Orphin took a year off to travel and gain some industry experience at Bombora Wave Power, a wave energy development company based in Western Australia. 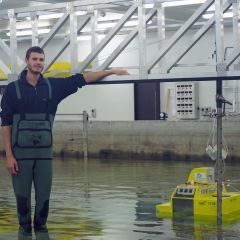 His short-term contract at Bombora allowed him to build upon the work he did during his final-year honours thesis, conducting experiments to test the company’s wave energy device concept in AMC’s model test basin. It further cemented his interest in the field of marine renewable energy, so he returned to AMC to start a PhD in Maritime Engineering in 2016. Mr Orphin’s three-year project aims to mitigate the uncertainty that currently exists in the hydrodynamic modelling of wave energy converters – machines that extract power from ocean waves and convert it to renewable energy. “The primary objective of this research is, firstly, to try and understand where these uncertainties in the modelling are coming from, and secondly, to develop procedures to analyse them,” he said. “We’re looking to replicate the experiments that we’re doing here (at AMC) in another facility to get an insight into how the laboratory influences the test results, and that will help set the benchmark for how certain each facility is in producing that data. Ultimately, Mr Orphin’s research findings will be used to improve international best practice for physical modelling of wave energy converters. He will propose a new set of guidelines for use by developers to allow them to collect more accurate data. The results will be shared with the international research community through first-quartile journals and the International Towing Tank Conference – a voluntary association of organisations that conduct hydrodynamic testing to predict the performance of ships and marine installations around the world.